Windows phone is a growing platform, just recently it took over apple’s iOS in India to become the 2nd largest mobile OS ecosystem standing right next to android, thanks to Nokia Lumia series phones. There are lot of good applications which are popping up slowly on windows phone store. Other than official twitter app there are many full fledged twitter clients for windows phone like Gleek, Rowi and Tweet it. 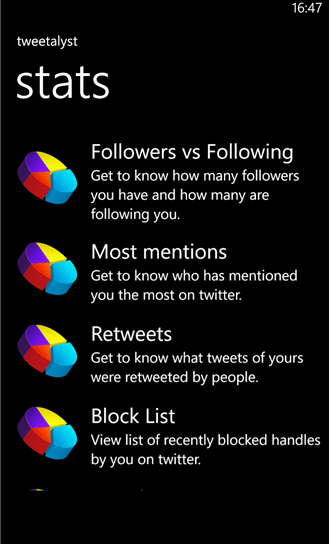 Tweetalyst is a companion app for twitter mainly focused on giving stats for user’s twitter data. The application aggregates simple information like tweet count, follower count, mentions and shows in the form of charts. We have seen people using windows phone in India complaining about lack of free apps on store. Tweetalyst application is available on store for free. Download from Windows phone store, we would like to hear from our readers about windows phone ecosystem. What makes windows phone superior or inferior to android/ iOS and of course please let us know your favorite apps on these platforms. Dont call it the Lumia series of phone in general. Its just because of the low end phones of Nokia the market share in India is growing. If a well versed brand is offering a modest smartphone at a cost of less than 10k in India, its bound for glory.. And its certainly not because of the other high end models. Well I was not saying about Market share of Nokia, I was talking about Market share of Windows Phone.. Of course, It has to be because of Lumia series right? Well, I am aware of low end nokia phones running on Nokia Asha OS, which anyways doesn’t contribute for Windows Phone market share… Phone likes Lumia 520,620,720 etc are what I am mentioning to..